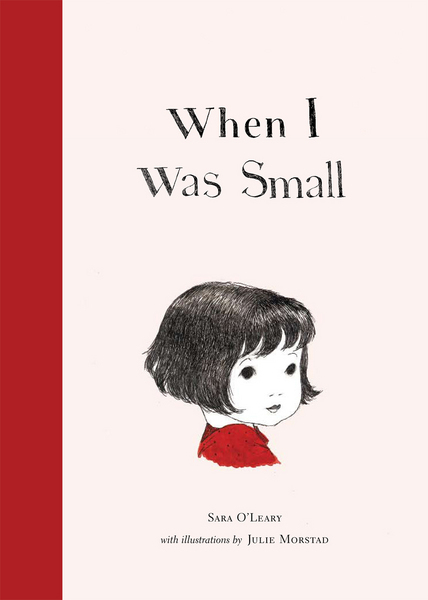 When I Was Small is an adorable sequel to ‘When We Were Small’ and ‘Where You Came From’ and just as beautifully executed by Sara O’Leary and Julie Morstad. A highly collectible set of hardback books, fabric-bound with the most wonderfully unfurling tales supported by a plethora of beautifully understated illustrations. Curious Henry has yet another question for his mother to which O’Leary’s delicate and poetic text, provides beautiful answers with a touch of charming humour. Henry’s mother proceeds to describe her adventures when she was small, VERY small. Feasting on a raspberry and swimming in a birdbath, are just a few of the delightul answers she delivers to little Henry. This endearing story is one which children will enjoy and one that will resonate with parents everywhere. The perfect book for parents who will undoubtedly be required to answer similar questions over the course of time. Reminiscent of a beautiful vintage book, Julie Morstad’s timeless pen and ink illustrations with splashes of watercolour, provide a crisp, clean finish to accompany a heartfelt text. The illustrations and text float effortlessly upon large white spaces, giving a distinct feeling of how small Dorothea actually is. This long-term pairing of O’Leary and Morstad has been a touch of genius and clearly a winning combination, one which we hope continues well into the future. CCBC 2012 Pick, Best Books for Kids and Teens! My photo of When I Was Small does not do justice to the pervasive delicacy of Sara O'Leary's book. Holding the cloth-spined hardcover book with its unadorned font and images, the reader will feel whisked away to the simpler time of childhood. No matter whether the reader is eight or fifty years of age, When I Was Small will embrace the wonder of being little and the unconditional affection of a parent. Henry's curiosity about his parents' childhoods is satisfied with his mother's "recollections" of being younger. She shares with him a wealth of reminiscences: having a lady bug as a friend; wearing the same size shoes as her doll; playing jump rope with a piece of yarn. But her accounts become fantastical experiences in Julie Morstad's pen and ink drawings depicting the mother when she was small. Not just small as in young but literally small à la Thumbellina. Innocent observations of a mother, speaking to her young son, loving in her affection for her child and in her long-gone youth, are transformed into delightful intimacies for both mother and son. Sara O'Leary is frugal with her words, binding the experiences to youth, still many years away from the weight of adult words and worries. Likewise, Jule Morstad uses watercolours sparingly to enhance her ink illustrations but perfectly to capture the brightness of youth with the washed-out tones of another time. Anyone who argues that the book in any form other than electronic is becoming obsolete needs to bring a copy of When I Was Small into their life. The sheer pleasure of holding a story that is as delightful in its jacket as it is in its heart is very rare today and should be cherished. Sara O'Leary's When I Was Small is just such a singular luxury. There are lots of picture books on the theme of "what it was like when you were small, but in this case the mother jumps us into a world of delightful exaggeration. "When I was small," she tells little Henry, "my doll and I wore the same size shoes... I went swimming in the birdbath... I slept in a mitten..." Morstad's fine, delicate drawings enhance this Thumbelina-like fantasy, which plays with the relationship between youth and stature. Morstad's tiny girl with big eyes and bobbed hair evokes a young miss of the 1920s - very stylish. single raspberry, lived in a dollhouse and had a ladybug for a best friend. Montreal Gazette, When I Was Small, by Montreal’s Sara O’Leary (Simply Read Books, 32 pages, $18.95), has nothing to do with letters or books – unless you count the opening page, in which Henry is looking through a photo album, wishing he’d known his parents when they were small. “Tell me a story, he begs his mother. Tell me a story about when you were small, too.” And she does. “When I was small ... my name was Dorothea,” she says. “But because the name was too big for me, everyone called me Dot.” And so it starts, a story that grows progressively more whimsical – and owes a lot of its warmth and whimsy to the wonderful, quirky, scratchy pen-and-ink art of Vancouver’s Julie Morstad. The image accompanying that opening statement by Henry’s mom, for example, shows a class photo that includes a teeny, tiny girl dressed in red. Dot. “When I was small,” she tells Henry as she tucks him into bed for the night, “I couldn’t wait to grow up. Because I knew one day I would have a small boy of my own.” A beautiful book, and perfect companion to Where You Came From (2008) and When You Were Small (2006) by the same author/illustrator team. For ages 3 to 8. When I Was Small, the latest title in Sara O'Leary and Julie Morstad's series of picture books about inquisitive Henry and his playful parents and their recollections from the past, follows the same format as When You Were Small and Where You Came From. Like its predecessors, this latest book stands alone and can be read in isolation, or in conjunction with the other titles. In When I Was Small, Henry asks his mother to tell him about when she was small. Those who are familiar with the series will know that what follows is a range of wildly creative and humorous episodes from Henry's mother's life (or, more to the point, from her imagination). When I Was Small has the same somewhat "old-fashioned," charming design and presentation as its predecessors, including the same sturdy binding, solid hard cover, and thick, durable paper. There is also the same clever simplicity of the text and the illustrations that, in many ways, make an older reader yearn-just as does Henry-for the way things used to be. The phrase, "says his mother," is used 12 times in the book. This is obviously a deliberate part of the patterning and predictability of the author's text, but I confess that I found it grating and would have preferred more variety. Other than that personal preference, however, there is little about which to complain. The whimsical text and illustrations are in harmony one with the other. Indeed, Morstad's creative illustrations add interesting details that extend the text in a pleasing manner. For instance, when O'Leary writes of having lived in a doll's house, Morstad's artwork includes one bed with a frame made of clothes pegs and another bed frame constructed from pencils. With both text and artwork, the presentation is uncluttered and, with lots of white space, the book is easy on the eye. I expect that this book is more likely to initially catch the eye of a parent than a child, but children will enjoy it once it is shared with them. When I Was Small is a particularly nice book over which mothers and sons can bond. Those who purchase a copy of this book will be well pleased and will enjoy returning to it for many years. of adorable characters with splashes of color that are appropriately filled. classic addition to any small child’s library. It is books like this one that reminds me of why I adore picture books and love to review them. There is something about children’s literature that just oozes joy and wonder when a book is done well. Simple illustrations and spare but eloquent writing can convey so much. WHEN I WAS SMALL does this beautifully. The story begins with Henry, an adorable little boy that looks remarkably like my grandson Aiden (which instantly made me love him) asking his mother to tell him a story about when she was small. What follows is a charming and fanciful story about a very tiny, Thumbelina-sized tiny girl. The language is simple and concise, letting the ethereal and powerful illustrations do most of the telling. The illustrations, done in pen and ink have this Old World feel to them and makes me think I’d stumbled across the book in a used book store. It’s got this vintage look and feel and has a dreamlike quality. Each page is such a pleasure to read and look at. The reader is tempted to linger and examine the drawings. When I read it to Aiden and his sister Jasmine, they both asked me to read it again and again. Jasmine really loved a drawing of Henry’s very tiny mother feasting on a very large raspberry, while Aiden loved the illustration of her being borne away in the mouth of a cat. Both children and parents will love this book. It is simply enchanting and a strong message about the power of story. Henry asks his parents what they were like when they were small. The book starts out normally enough with his mother explaining that she was called Dot because her full name, Dorothea, was too big for her. But then things get creative! Dot was so small she wore the same shoes as her doll. She swam in the birdbath. She jumped rope with a piece of yarn. Her bed was a mitten. Her father built her a doll house, and she lived in it. At the end of this story from his mother, the two of them agree that one of the reasons that his mother looked forward to growing up was to share stories with a child of her own. O’Leary writes with a quiet joy that infuses the entire book. There is a gentle playfulness throughout and children will immediately know that this is a story being told and not the truth. Morstad’s illustrations have a delicacy to them that works particularly well with the more tall tale parts of the story. The illustrations have a sweetness to them that make me think of the old Golden Books. They are never saccharine thanks to their whimsy. This is the third in the series about Henry, but the first one that I have read. The first book in the series won the 2007 Marilyn Baillie Picture Book Award in Canada, so that one is definitely worth seeking out too. Appropriate for ages 3-5. My Mama's Goodnight - Sara O’Leary and Julie Morstad may be the finest writer/illustrator team since Roald Dahl and Quentin Blake. Their utterly lovely book, “When You Were Small”, is a feast of words and pictures the likes of which I have not seen in some time. Henry is a little boy who, like most children, likes to hear about when he was small. So, his loving father, with a penchant for exaggeration and wit, spins tales of Henry’s infancy when he could sleep in his father’s left slipper and bathe in a teapot. The whimsy with which O’Leary’s words spill forth is perfectly matched by Morstad’s gorgeous drawings. This is a match (and a book) made in Heaven. I would recommend reading it every night…right after your warm and fragrant teapot bath.